I first tasted Comanche Cellars Pinot when a friend brought a bottle to share over lunch at Center Street Grill in Santa Cruz. Upon trying it, I knew I had to find out more about it. It turns out that winemaker Michael Simons not only loves making wine, especially Pinot Noir, but he also is passionate about horses. He named his winery Comanche after a horse he had when he was 10 years old, and an image of Comanche’s old worn horseshoes now grace each label on every wine bottle. A story posted online of Simons meeting up with one of the last remaining cavalrymen, 90-year-old Sgt. MacDonald, is well worth reading. The WWII veteran rode the last ceremonial warhorse, Comanche I, at Fort Ord in Monterey until 1994. ​At the 9th annual Pinot Summit, held by Affairs of the Vine, Comanche Cellars was awarded a Gold medal by the professional judging panel for the 2011 Comanche Cellars Pinot Noir, Chareva Vineyard, Arroyo Seco. This wine was also voted 3rd overall favorite of the male judges in a blind tasting conducted on Sunday, March 9, at Pinot Summit, held at the Golden Gate Club at The Presidio in San Francisco. The 2011 Chareva Pinot Noir was earlier acclaimed by Rusty Gaffney, Prince of Pinot, as his favorite of all the wines in the final tastings of the Pinot Shootout. It can be described as a satisfying plum pudding of winter fruits, including plump figs and Montmorency cherries, with brown sugar and molasses. Great acid, tannin and texture, and a sleek, satiny finish. Kudos go both to winemaker, Michael Simons, and to grower Frank Stanek, winegrower/owner of Chareva vineyard, who named the property for his two granddaughters, Charlotte and Eva. They are both very excited to visit their grandfather to help him prune and pick. The 2010 Comanche Cellars Pinot Noir from the Santa Lucia Highlands, was awarded a silver medal by the judges. Made of fruit sourced from the Hahn, Paraiso and Sarmento Vineyards in the SLH, this is a bold wild, fruit-driven ride through bramble bushes laden with black-fruited goodness, tinged with spicy bay laurel, sage and dark licorice. Robust and bursting at the seams with exuberant ripe fruit. Comanche Cellars has been named Wine of the Week! The Comanche Cellars pinot is from Hahn, Paraiso, and sports lovely flavors of ollalieberry pie, strawberry jam on dark rye toast, and toasty flavors of carmelized pecans. 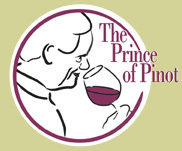 Prince of Pinot declares 2011 Comanche Cellars Chareva Pinot his favorite at Pinot Shootout Finals! Taste this fabulous wine and many others during the blind tasting at the Pinot Summit, to be held on March 9 at the Golden Gate Club at The Presidio in San Francisco. VIP packages include champagne brunch, seminars, Blind Tasting, Grand Tasting and Awards Ceremony.